Loving your job and going above and beyond expectations what makes a good teacher a great teacher. Every few weeks during the school year, NewsCenter1 and First Interstate Bank team up to recognize teachers who are exceeding expectations and give them a $500 grant to support their work. General Beadle Elementary School’s Jonni Hertel is one of those great teachers. The third grade teacher is also the last winner of the 2017-2018 school year. Hertel started an afterschool program for her students to delve deeper into the things they learned during the day. "We do so much throughout the day that there’s sometimes things that I want to do, but we don’t have the time for it," Hertel said. For Hertel, teaching is more than a job. It is a labor of love for her students and her community. "Ensuring that my neighborhood – that my northside community – thrives and excels is so important to me,” Hertel said. “I would give my right arm for these kids to help them develop and be successful." The work Hertel does with her students was one of the most exceptional stories ever submitted for the 1+1 Giveaway. "What seemed to stand out to me was that it was all out of her own pocket,” said Amber Whitford, loan processor for First Interstate Bank. “It was an afterschool program for her kids, and 28 out of the 29 would attend. So it seemed to be something that was very important to them and something that needed to continue. I know how hard it can be to try and fund things out of your own pocket and make things happen." And Hertel already knows what she wants to do with the money for next year. "I want to start a runners club, a northside runners club for the northside schools,” Hertel said. “They have a cross-country for elementary schools A lot of our kiddos can’t make it across town, so that’s one of the first things right at the beginning of the school year, is a Northside runners club that will include Knollwood, Horace Mann, and General Beadle." 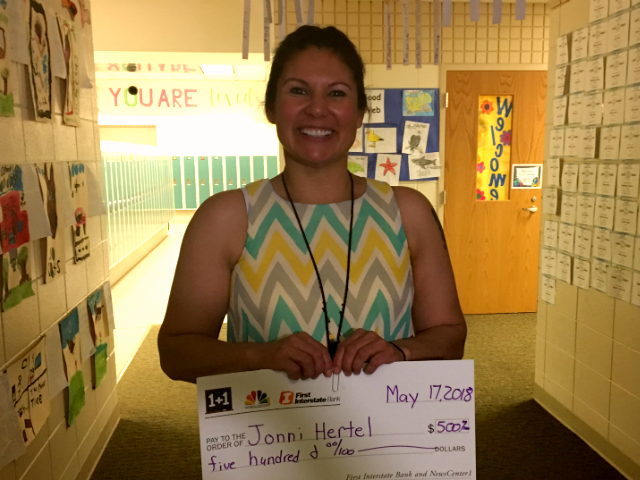 While Hertel is the one who earned the 1+1 Giveaway, she gives most of the credit to her students. "We work hard. They work hard, because this is because of them,” Hertel said. To nominate yourself or another area educator for the 1+1 Giveaway, CLICK HERE. View other winners HERE.